We decided to make Thanksgiving dinner on Shabbat – to save me the insanity of cooking for two days straight. After reviewing our options and consulting with those in the know, I present to you my menu. Of course I will be baking challah to start off our meal – does one make braided challahs or round ones for Thanksgiving? We will start with a Butternut Squash Soup (I hope the kids don’t complain that there is no gefilte fish or that there isn’t chicken soup). Main course will of course be the turkey that is currently defrosting in the fridge. It’s 14lbs so it will take a while to cook. I don’t think I am making stuffing – there will be plenty of side dishes, so I don’t think it’s necessary. I will just put some lemon wedges in the cavity with an onion or two. I will (gulp) buy cranberry sauce – never having had it, I have no clue how to make it or how it should taste. I usually have my turkey with applesauce. Hmm. Maybe I should make my own…. I will also be making my “Crapple Cobbler” – ok that’s short for cranberry-apple, or cranberry-pineapple. What I love about this dish is that you can eat it hot, cold, with a main course, on its own. It is yumminess personified. Another side will be steamed green beans, either with slivered almonds or toasted sesame seeds. I may even make them into a cold salad and add sliced Italian tomatoes and make a zesty vinaigrette. For dessert – well, I doubt anyone will have room for afters, but I have to prepare something, maybe baked apples? Or apple pie cake a la mode? Suggestions? 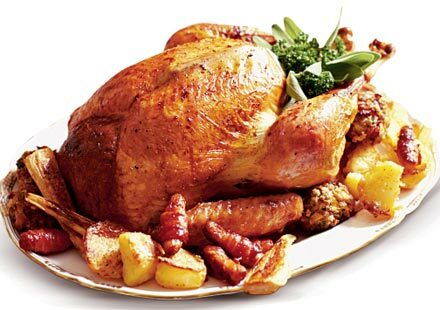 The kids are so excited to have turkey – I haven’t roasted a turkey in donkey’s years – all they remember is that when I last roasted one I roasted it upside down. I shall see if I can do the same this year, and follow in the family tradition. Homemade cranberry sauce is very easy and sooooo worth it. The very first time I made a turkey by myself, I accidentally roasted it “upside down”. It turns out, some people do this on purpose, because the breast is especially juicy when roasted that way. Sounds yummy, Hadassah! We also do the Friday-night Thanksgiving dinner (mostly because here in Canada, American thanksgiving is not a day we get off!). I don’t make an entire turkey because there aren’t enough turkey-lovers in our household, so I make a turkey breast. This is the best recipe ever for turkey breast: Garlic and Herb Roasted Turkey Breast with Tarragon Mayo. The best part is, besides the fantastic leftovers, the carcass make the most delicious “chicken” soup. And I couldn’t do thanksgiving without stuffing. I LOVE stuffing. I use the mushroom (sorry Hadassah) celery stuffing recipe in the purple Spice & Spirit cookbook, and I cook it separately in a pan (about 30 min for the amount the recipe calls for). Delicious! put sugar and water in pot. Bring to boil. drop in cranberries. boil 10 min. That’s it! The canned stuff can’t compare at all! I also make a diabetic friendly version. Homemade cranberry sauce is much better than canned and easy. bring a cup of water and a cup of sugar (white or brown as you like) to a boil and add a 12 oz package of cranberries (I am assume you can’t get fresh in Monsey, but they are better if you can) simmer for 10 to 15 minutes, then cool it at room temperature for a while and put it in the fridge until dinner. If you like, add a little citrus peel. Homemade cranberry is super easy. 1/2 to 1 cup OJ, one bag cranberries, dash each: ginger, nutmeg, cinnamon, pepper, salt. Cover and cook over medium 10 minutes or so- berries will pop and everything will begin to look like jelly. If it’s really thick add a bit more OJ and stir. Taste test for tartness- our family likes it tart so we use about 3 tablespoons of sugar. Nothing is really measured. The OJ amount is my best guess from years of making it. If you want to get really fancy before you add the OJ you can add some brandy and flambé the cranberries and then add less OJ when you finish cooking them. Baked apples and ice cream! If you want to keep with the traditional Americana of it… Pumpkin Pie is a must for dessert! Sounds wonderful. Just check with the Americans if they expect something specific like the stuffing. Enjoy! but … but … the stuffing is the best part! what else are you going to put the cranberries on?! OK OK OK I HEAR YOU ALL – I need to make cranberry sauce and stuffing. Wow, you guys feel so strongly about your food!! Can I buy stuffing mix or is it best home-made? as a time saver, you can buy the plain stuffing cubes. I get those, and add all of my own seasoning, veg, etc. The meal was rounded out by gold potatoes mashed with a little garlic and extra-vigin olive oil, steamed string beans, and pear onions braised in red wine (more of the Baron Herzog.) as well as a green salad. Hummus was our appetizer, and we had sorbet and biscotti for dessert.